Automobile, pharmaceutical, food &beverage, chemical and most other manufacturing industries have processes that need large amounts of thermal energy, which is also termed as Industrial Process Heat (IPH). This energy has been traditionally supplied by burning non-renewable fossil fuels which cause environmental pollution. Prices of industrial fuels like Furnace Oil, LDO and HSD have increased at a steep rate of fifteen percent per annum over the last decade. Since India imports almost eighty percent of its oil consumption, industries are facing a risk due to volatile international crude oil prices. 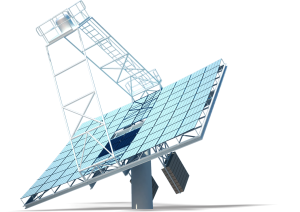 Even though several applications are possible by harnessing solar thermal energy, utilising it to generate solar steam is the most economically viable. Not only does it offer a potential solution to the oil security threat confronting India, but also a remedy to the environmental damage caused by conventional fuels. Use of concentrated solar thermal technologies(CST) / solar boiler like ARUN will help companies in capping on their long-term fuel expenses. Mentioned below are some of the thermal energy requirements of a few industries and how Clique Solar’sconcentrated solar thermal system and solar boiler - ARUN - can help meet their thermal energy requirements. 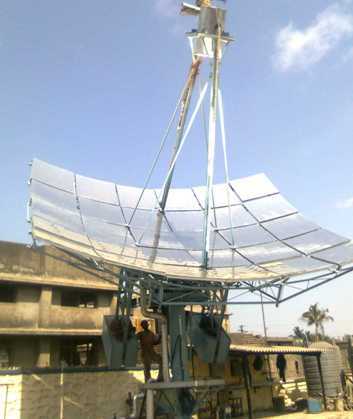 In solar assisted cooling systems, solar heat is used to drive the cooling process. As many cooling loads, have a high coincidence with the availability of solar irradiation, the combination of solar thermal and cooling has a high potential. ARUN dishes have been installed successfully at Turbo Energy Limited for comfort cooling purpose.